Bump into the Era of Deconstructed Indian Lehengas ! Since ages, Indian lehengas have been crowning the beauty of the brides, who are entering into a new relationship of life on their wedding day! Lehenga is not only a mere outfit, but a kaleidoscope of many precious memories that are profoundly attached to your D- Day and afterward events. So, the importance and value of this outfit cannot be compared to anything else! Nowadays, the trend is of experimenting and playing around with cuts and silhouettes that are readily reaching us in the form of designer lehengas. This style check has given a big relief from seeing all those usual and boring patterns in the markets. 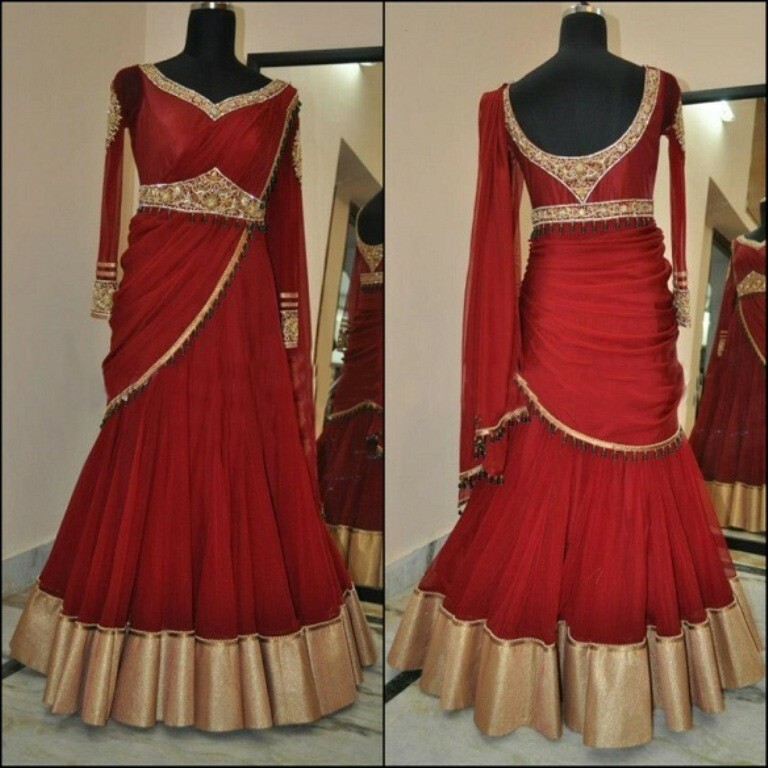 Draped/semi draped style lehengas are amazingly great to go for ladies, who just cannot afford to carry a free-hand dupatta gracefully and require an effortless outfit to wear in parties and functions. The most of all required presence is of ethnic cholis, which have been totally replaced with stylish crop tops these days! A modern day girl today is extensively going for a crop top, instead of a usual choli to team up with her lehenga skirt. This fashion is a big hit in the town and gives a sensuous appeal to your look. So, go on dressing like this and win hearts wherever you go! The intricate traditional embroidery present on the lehengas for radiating a regal charm has now been switched by the beautiful prints, which are trending crazily in fashion world. Online Bollywood lehengas are offering a huge assortment of prints in various colours and patterns to the chic stylish customers out there! The fashion hack of pairing contemporary contrasts together is working out extremely well these days. And girls are readily welcoming this sizzling trend straight into their closets! 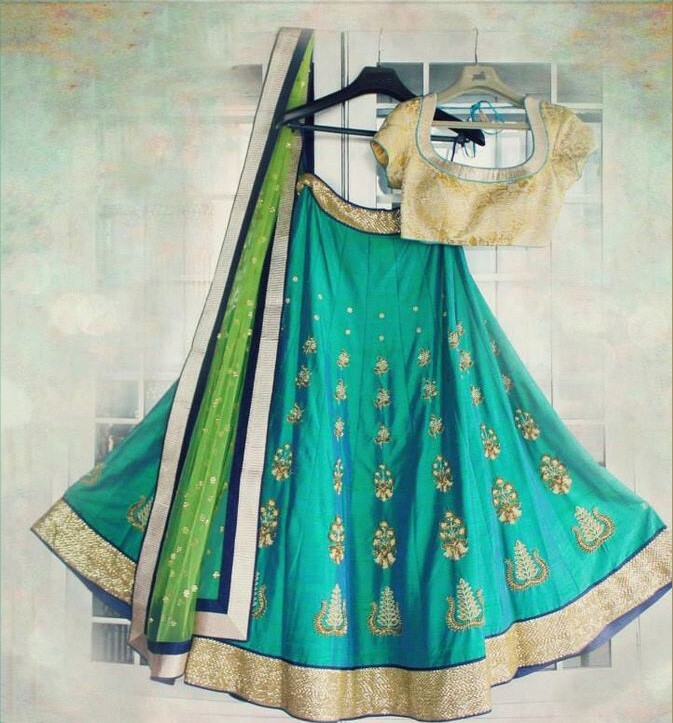 Georgette lehengas rock this look the most! Stunning! But with the stretch marks on my tummy, I need to lengthen the blouses. These are absolutely stunning Charu! I am in love with the first red and gold dress at the top…gorgeous! Awesome collection Charu..Thanx for sharing the ideas .. I am in love with floral lehngas these days, really want to get one. The colour combination is awesome of all the lehenga, perpale and white is looking awesome. Lovely designer Lehengas indee. The beauty of it is that you can own 3 of them and mix and match them. xoxo – Chaicy – styleapastiche.com – Style.. a Pastiche! The Georgette lehenga is stunning! Nice review and pretty lehengas ! Ethnic dresses always add more charm to Indian beauties; whether it is designer lehenga or ethnic kurtis. All lehanga's designs are beautiful but love the most blue one. Thanks "Charu" for sharing this amazing post.